The ESL programs offered at NCFTA are designed for international students, new immigrants or visitors to Canada with various needs. The open admission and various levels allow students to take courses that are most convenient and appropriate to them. The College awards a Certificate in English as a Second Language to students who successfully complete one of the following ESL programs. 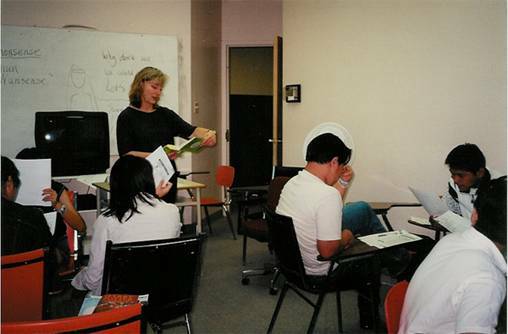 To ensure that students receive the best possible ESL instruction, each class is taught by a well qualified teacher. Classes feature student participation and individualized attention. Instructors and students use the newest multi-media technology, such as computers, laser-disc players, and closed-caption TV. Students also participate in various social and educational activities such as Maple Syrup tour, museum field trips and special holiday festivals. Six levels are offered on a two-month basis with student intakes on the first workday of every other month. Courses emphasize language skills, communicative skills as well as Canadian culture. The higher level English program with student intake every month helps you improve your communication skills in a variety of situations. This course is specially designed for the local high school and university students who have been in Canada for over 3 years. Experienced instructors teach grammatical rules, writing techniques as well as rhetoric, and inspire students’ appreciation of masterpieces of English literature through reading so as to improve students’ writing skills in a full spectrum. The course is designed for new immigrants and international high school students, focusing on listening, speaking, reading and writing skills. Experienced instructors will polish students’ grammar and organize various cultural activities and field trips in order to help students apply these language skills in everyday life. The high level English program with student intake every month prepares you to reach a high TOEFL score. Length: 60 hours over 4 weeks. The ESL/EFL teacher training program with student intake every other month is designed for people who want to teach English in their native countries in the future. Created By JL Tech. Copyright © 2014 JL International Group. All rights reserved.